Classic fitted wardrobes made for one of our client who living in Chiswick, west London. 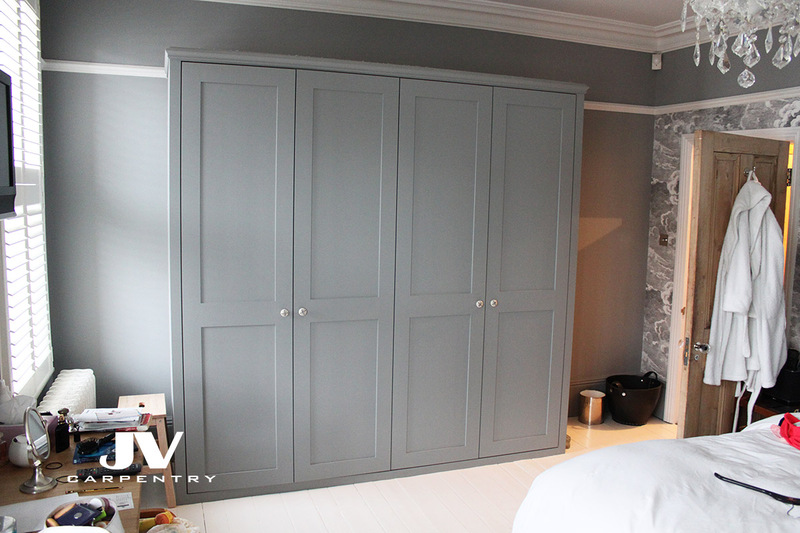 These bespoke wardrobes made of quality MDF and hand painted Farrow and Ball Estate No.88 Lamp Room Gray colour. This alcove wardrobe made in line with existing picture rail and we managed to find the same picture rail to match the existing and install it on the top of the wardrobe. 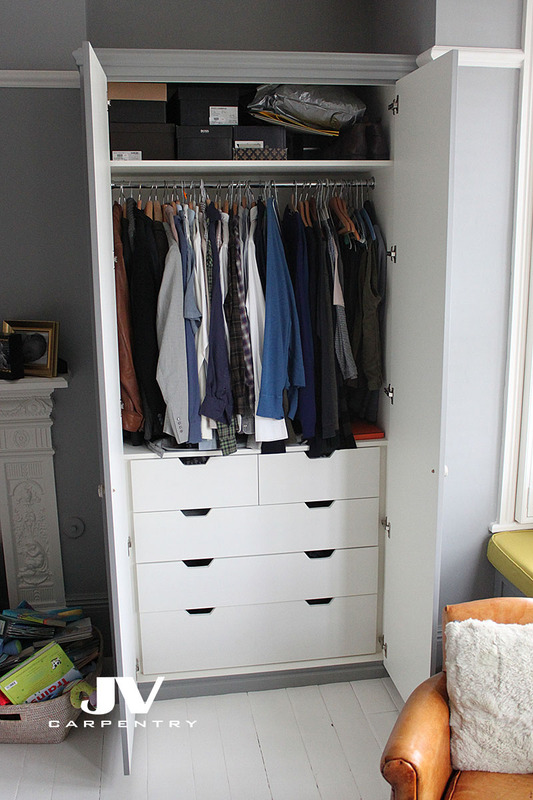 This fitted wardrobe made with 3 large drawers at the bottom and two smaller drawers at the top, top storage shelf and hanging space. 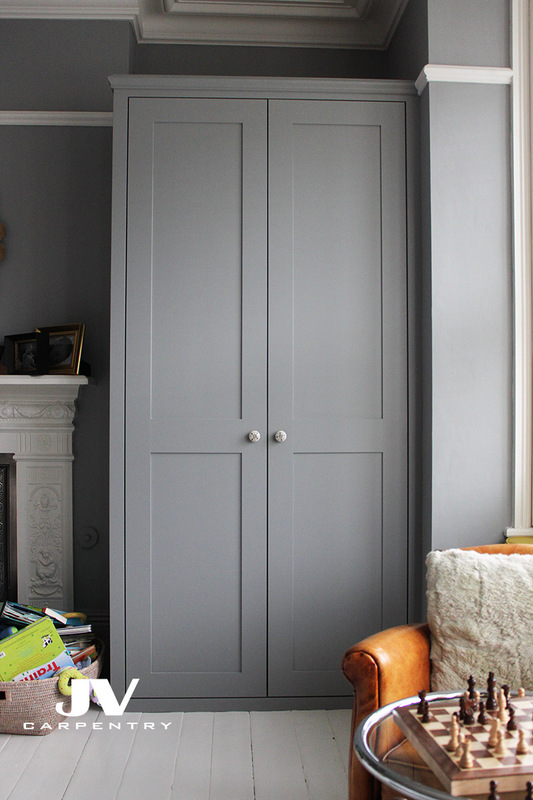 To paint interiors of this bespoke wardrobe we used white eggshell paint to make it brighter. The wardrobe made with shaker doors, 110° concealed hinges and heavy duty quality drawer runners. This second fitted wardrobe made on opposite wall to that alcove wardrobe. It was made with shaker style doors and existing picture rail running across the top. Made of quality MDF and hand painted on site with grey F&B estate eggshell paint. Interior of this fitted wardrobe made with column of 6 small drawers which give plenty of storage place for socks and underwear. 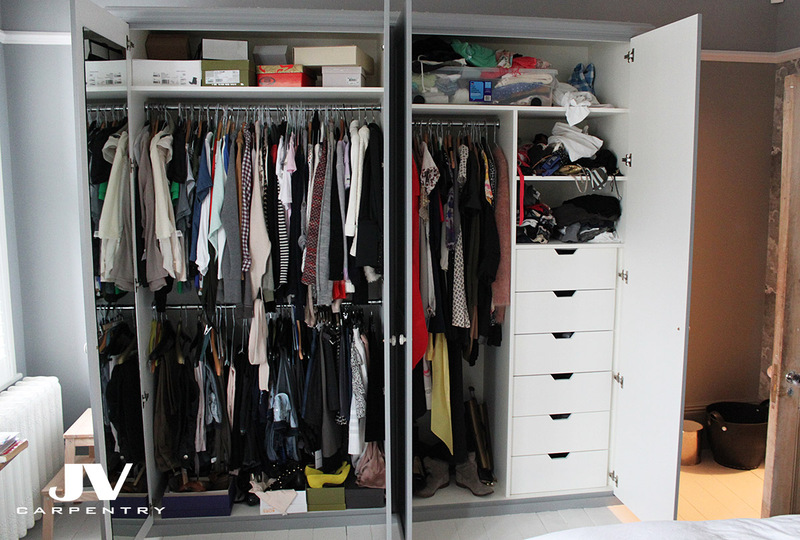 Inside this fitted wardrobe on the left you can see double hanging rails for short clothes and long section with hanging rail for long dress. Interior of this wardrobe hand painted white eggshell to add some extra brightness. We installed a full length mirror at the back of the door of this bespoke wardrobe.